Contents and Media: 32 pages plus cover; full colour; soft cover; A5 Landscape format. Disadvantages: All Polish text and captions; detail photos of restored "warbird"
This small book from Polish publisher Rossagraph covers the airframe details of the Messerschmitt Bf 108B Taifun in considerable detail over 32 full-colour pages in A5 landscape format. 91 captioned photos and illustrations are packed between the covers. The vast majority of the pictures are high quality photographs of a restored Bf 108 warbird. Details of the cockpit, instrument panel, engine, luggage compartment, undercarriage and general airframe details are well documented. There are even a few good views of the interior of the engine cowl for the determined scratchbuilder. The only disadvantages are that the entire text is in Polish (although, of course, this is only a disadvantage if you can't read Polish); and that the details of the restored Bf 108 may be quite different to a wartime Taifun. These differences are most obvious in aspects such as the instrument panel, radio, harnesses, mats and wheels. 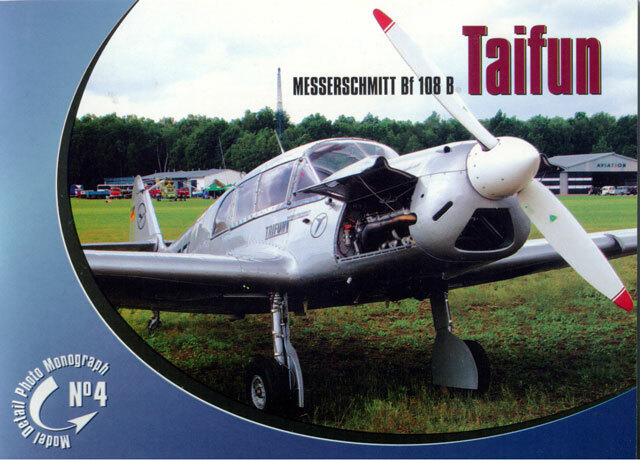 This will be a useful little book to anyone building the recent Eduard 1/48 scale Messerschmitt Bf 108 Taifun. Thanks to Karaya for the review samples. Model Detail Photo Monographs are available from Karaya's website.